The result left me saddened and angered that such a travesty of injustice could be imposed on people who gave it their all in pursuit of victory. We all know now of the circumstances that led to our exit, by way of the hand of a Frenchman who once was a model for integrity in the modern game. Tomes and songs will be written about that “goal” and I don’t want the game to remembered for just that.What last night was was the finest display of football by an Irish team in years and perhaps the best display I’m seen in my lifetime. Yes I can recall Italia ’90, against Italy in USA ’94, the defeat of Holland in 2001 and the draw with Germany in 2002 but this eclipsed all that. This was an Irish team fighting for themselves, each other and an entire nation, against a dubious play-off seeding process and a French side of superior footballing prowess. This was David versus Goliath stuff and for 90 minutes we dominated a footballing giant. From the off the Irish took the game to the French. Sure the French started confidence but you could see that the Irish team was not overawed by the task at hand. Time and time again Ireland were winning the 50/50 ball, prodding and poking the French defence and testing ‘keeper Hugo Lloris. The French suffered an early blow when, in the 9th minute, defender when Julien Escude went down with a head injury and could not return. Sebastien Squillaci was brought on in his place but there were still 81 minutes of normal time to go and an early substitution would not have been in coach Raymond Domenechs game-plan. The Irish were getting plenty of play down the wings and Kevin Doyle came closest to opening the scoring for the Irish. He failed to make enough contact with a close-range header after a sublime cross from Liam Lawrence. At the other end new sub Squillaci had a chance from a Henry cross, but his header sailed over the crossbar. The French midfield was being dominated and their full-backs were enduring a torturous time from Ireland’s raiding wingers. With Ireland looking more and more dangerous the ball fell to Kevin Kilbane on the left. The winger turned full-back, enjoying his record equalling 102 appearance in an Irish shirt, played a beautiful neat ball into the path of Damien Duff. Duff raced down the wing and looked like he was heading out of bounds when at the byline he spun and turned the ball back into the box. Ireland’s captain and record goalscorer Robbie Keane was lurking with intent and sure enough he side-footed the ball, beyond the out-stretched diving arms of Lloris and into the back of the net. Goal 41 in 96 internationals for Keane and surely one of his most important. The 15,000 strong travelling support in the Stade de France erupted and for Irish men and women at home and around the world the believe returned. The dream was on and France looked shell-shocked. The ten minutes until half-time stretched to an eternity and some nervousness entered the Irish team. France spurned a couple of good balls but never looked like restoring parity. Half-time arrived with the Irish confidence in full swing and with Shay Given looking relatively untroubled in the Irish net. So here we were 45 minutes down, a potential 75 to go, sitting on a one goal lead that would be enough to take us to the lottery of the penalty shoot-out but not quite to South Africa. 22 years since we had last beaten a side ranked above us away from home in a competitive international, was history about to deny us again? Whatever Giovanni Trappatoni said at half-time seemed to work for the Irish as they started the second-half the brighter. A great chance fell to John O’Shea but the Waterford man shot over from a tight angle. We knew a second goal for us would leave France needing two, but we couldn’t risk going for the jugular lest we leave ourselves exposed at the back. A big chance came for Duff in the 61st minute when Lawrence played a beautiful through ball into the path of the Irish winger. Under pressure from the encroaching Bacary Sagna, Duff shot early but French ‘keeper Lloris rushed quickly from his line to close the angle and pull off a fine diving save. Still we were threatening and France had yet to impose their might. The physical exertion started to extol an attrition on the Irish players and soon Glenn Whelan was forced off injured, to be replaced in midfield by Manchester United’s Darron Gibson. Defender O’Shea quickly followed replaced by Paul McShane. Groans of despair went round the Stade de France and through Irish fans as McShane has been known on occasion to make rash and costly bad decisions. France started to gain the upper hand and as the half wore on they began to create more and more chances. Nicholas Anelka spurned a golden opportunity, flicking a header wide of the far post. But the Irish were back in it with Robbie Keane getting possession in the box only to take a heavy touch, which pushed him past Lloris, but out of play behind the goal-line. France continued to push for a goal that would send them through to South Africa without the need for extra-time but the Irish defence stood resolute and defiant. Full-time came and 30 more minutes of action were guaranteed. Irish nerves were frayed and an entire nation left on tenterhooks. Could we survive 30 minutes of French attacking flair, could we nick a goal that would secure or qualification or would we go out after defeating one of world football elite teams over 90 minutes on their own turf? Into extra-time and Irish hearts were in mouths as 5 minutes in Anelka tumbled in the box. The referee ruled that the pressure from Given was not a foul and a goal-kick was the result. Crisi averted for now but the French were definitely in the accendancy. Moments later and the Irish were not so fortunate. 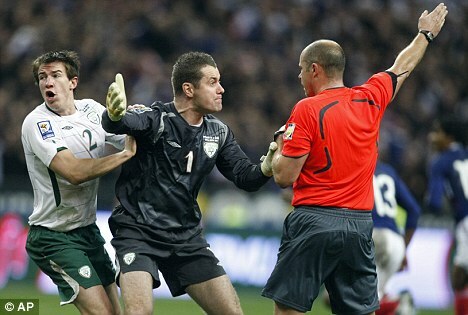 French defender William Gallas bundled the ball into the back of the Irish net but Given and the rest of the Irish team were quick to rush to protest. TV replays clearly show French striker Thierry Henry handling the ball but the referee should firmly by his decision and the goal stood. Aiden McGeady was sent on as the Irish fought valiantly to restore their lead. Their efforts were in vain as in truth the damage had been done and only the home side looked like grabbing a second. So after 120 minutes of joy, despair, agony and heartbreak France were on the plane to South Africa and Ireland on the flight home. We’ll be back but with 10 months between now and the next competitive international it’s hard on us fans. We should take heart from the performance of this, our Irish football team. They deserve or respect and admiration for giving it their all and leaving every ounce of effort they had out there on the pitch. It will be hard watching the World Cup in 8 months time and thinking what might have been. The calls for video referees and of French cheats will ring long into the night, but for now let us reflect on those brave men in green and white and offer them a toast. We salute you, proud sons of Erin. This entry was posted on Thursday, November 19th, 2009 at 9:27 am and is filed under Sport. You can follow any responses to this entry through the RSS 2.0 feed. You can leave a response, or trackback from your own site. Excellent piece. Spot on. Come on Ireland! You know what, that was brilliantly written. Kept me interested the whole way. @Darren Thanks very much. I must try harder to convert you. A well thought piece with good research and solid points. A replay would by no means gaurantee a favourable result, we played a great game and showed character, and can hold our heads high. One would hope that this injustice would at least lend extra weight and pressure Fifa into introducing some sort of goal line technology or other associated measures. Well, the article is in reality the sweetest topic on this related issue. I agree with your conclusions and will eagerly look forward to your next updates. Just saying thanks will not just be sufficient, for the extraordinary clarity in your writing. I will directly grab your rss feed to stay abreast of any updates.